The zero-emissions smart car is on the cusp of revolutionizing what we drive, how we drive and how we pay for mobility. Three disruptive technologies (electric batteries, autonomous driving and connectivity) are enabling companies like Google, GM and Lyft to rethink the design and commercialization of the automobile. These companies envision a global market for zero-emission smart cars that solve the congestion and pollution impacts in a world now defined by urbanization and mega-cities. As outlined in the first of this three-part series, the zero-emission smart car is an elegant economic solution that will use existing urban infrastructure to reduce, or even eliminate, congestion and deadly air pollution. Connectivity to digital devices and smart buildings. Adoption of any one of these technologies will have a profound influence on car design. But it is the synergies gained by combining these technologies into car design that will be transformative. The synergistic impact of these technologies are so disruptive that Ford’s leadership has begun describing themselves as a mobility, rather than car, company. Electric cars have fuel costs competitive with 75 cents per gallon gasoline and are an obvious solution to the deadly air pollution that now defines the world’s 22 mega-cities. The just announced Chevy Bolt is a breakthrough, all-electric car that solves daily urban range-anxiety at a competitive price. The Bolt offers a 200-mile range between charges. Its $30,000 price after tax incentives is significantly below today’s $33,000 average for a conventional car. 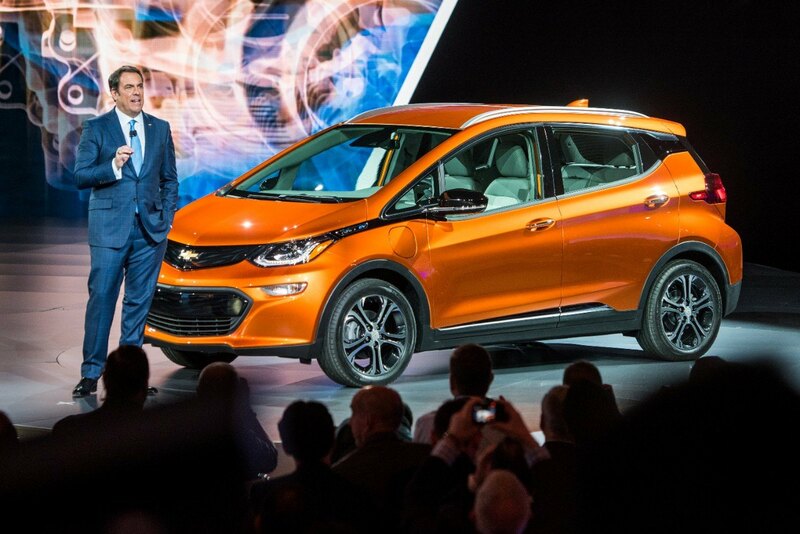 While the Bolt has the first-to-market innovation lead, what I saw at the 2016 North American International Auto Show was an auto industry committed to making electric cars competitive on price and performance. For example, Ford announced a $4.5 billion commitment to launch 13 electric car models by 2020. Renewable electricity generation is the ancillary step for delivering cleaner and price-competitive electric cars. Recent bids into utility RFPs are documenting solar and wind as being at least price competitive, if not lower than, fossil fuel generation prices. The most disruptive trend is the emergence of homeowners installing solar systems that are paid for through utility bill savings. An increasing number of these solar homeowners are using their utility bill savings to lease an electric commuter car that they fuel for “free” from their solar system. The autonomous-driving vehicle is a technology mega-trend sweeping both Silicon Valley and Detroit. Autonomous cars offer the potential of increased safety, reduced fuel consumption, reduced emissions and increased human productivity. Just one example of the collaboration building between Silicon Valley and Detroit is the recent joint announcement by Google and Ford that they will develop an autonomous car that can be mass produced. Few car companies at the North American International Auto Show did not have a plan for exploring and developing autonomous car technology. Connectivity is the thread that enables a radical commercialization path for electric cars with autonomous driving. Enabled though big data and the Internet of Things, connectivity creates a path for real-time delivery of mobility as a service -- think: Uber delivering an autonomous, electric car you can rent and pay for with your smartphone. During the ride, your smart car provides seamless and secure connection to your home, place of work and digital media. It is this vision that is one of the reasons GM just announced a $500 million investment in Lyft. This vision is actually being pursued in the San Francisco Bay Area. Bay Area cities and government agencies are beginning to work together on “default-to-green” solutions to traffic congestion and air pollution created by the daily urban commute. Embolden by the technology capabilities of the region’s high tech companies they are envisioning a transportation system that delivers real time, just in time, mobility as a service. This service would be sourced through smartphones and would optimize individual mobility service from a full range of transportation and cost options that will include autonomously driven electric cars, low emissions buses of various sizes and light rail. The idea is that commuters could stop driving to work and instead schedule their commute through their smart phone with the default to green smart system delivering mobility solutions optimized for cost, convenience and reduced emissions. This article is sourced from my participation at the Looking Further With Ford event held at the 2016 North American Auto Show. The third article in this series will detail how zero-emissions smart cars will change how we think about cars, how we drive and how we live.